Ri Sol-ju, the wife of North Korean leader Kim Jong-un, upheld an overwhelming presence on the carpet leading to the Peace House in the South’s side of the truce village of Panmunjeom on Friday. Friday’s historic summit between South Korean President Moon Jae-in and North Korean counterpart Kim marked not only the first time the two leaders met, but also the first meeting for the two first ladies. Ri arrived at the Peace House in Panmunjeom on Friday for the banquet in an apricot two-piece dress without any accessories. All eyes were on Ri’s simple yet elegant fashion choice for the night as she got out of the Mercedez-Benz S600 Pullman Guard luxury limousine. 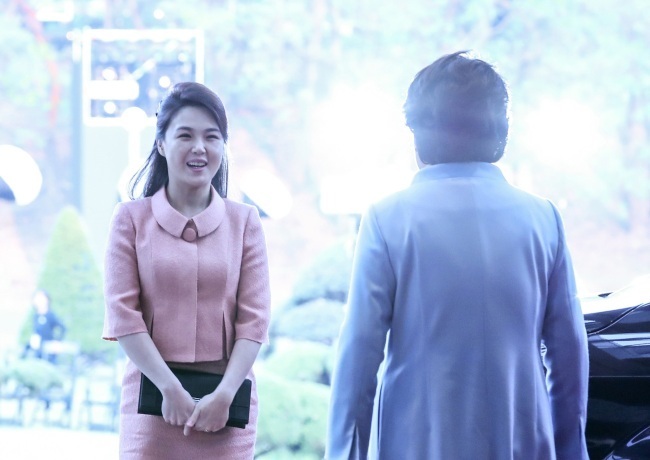 South Korea’s first lady Kim Jung-sook, who wore a light blue dress coat, greeted Ri warmly. 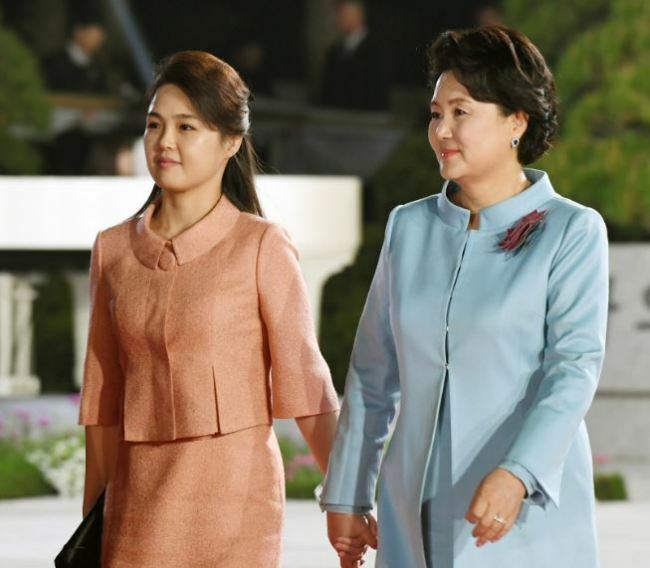 The two first ladies’ wardrobes complemented one another with local media outlets offering the interpretation that Ri’s color choice symbolizes the “coming of spring” or “peace” on the Korean Peninsula. Ri did not wear the brooch that she has frequently worn to past events, and instead carried a black clutch and had her hair neatly tied back. Making her first appearance in North Korean media outlets in July of 2012, Ri grabbed the public’s attention with her notable fashion sense. In the past, she was reportedly seen wearing darker shades in public, but her more recent outfits take on a brighter tone. 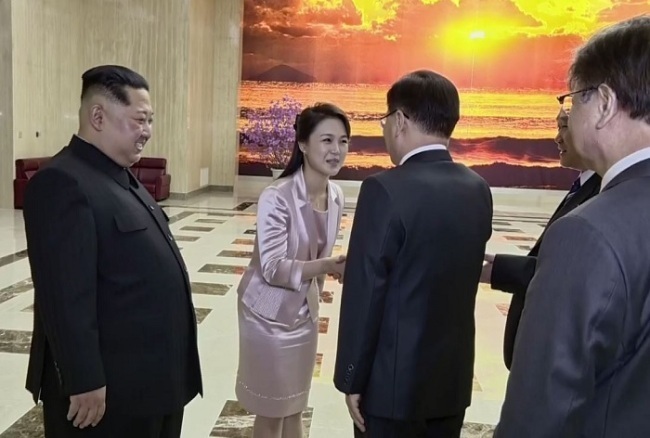 In early March, in a pastel pink dress, Ri accompanied Kim Jong-un to the dinner event hosting Seoul’s National Security Office chief Chung Eui-yong and other special envoys in Pyongyang. 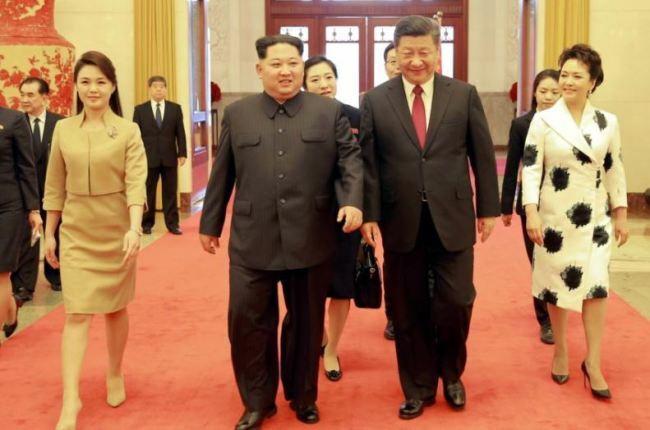 Media outlets also showered Ri with compliments for her outstanding wardrobe choices -- a gold two-piece dress, bright pale green skirt and white long jacket and a rose-patterned white dress -- when she accompanied Kim Jong-un on his trip to China in late March. It is said Ri has become the top fashion inspiration and role model for young North Korean women. One North Korean female defector said that whenever Ri comes on television the first thing they see is what Ri is wearing.